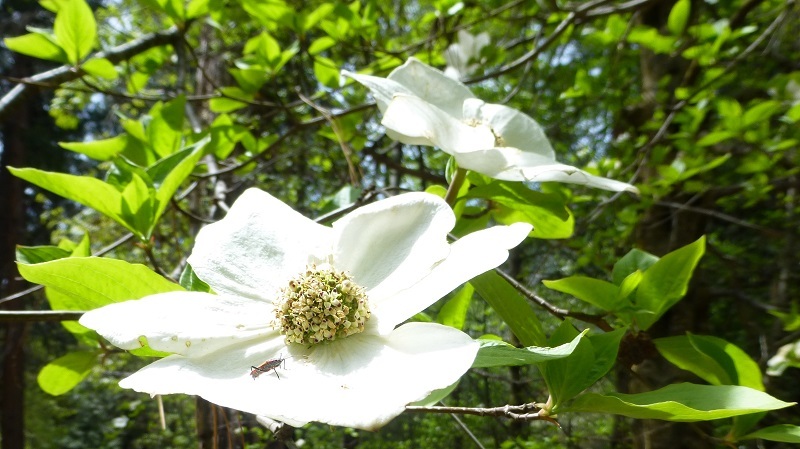 We were on the hunt for those beautiful big white blooms of the dogwoods. We headed to Yosemite Valley to see what we could find. As we drove in, we were watching out for views of the waterfalls and were treated to a superb view of Yosemite Falls in the morning. 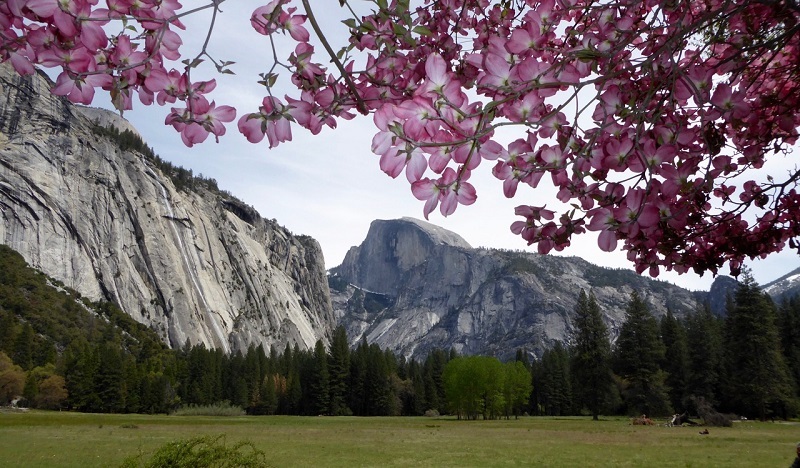 We parked at Curry Village (newly named Half Dome Village) to check out the dogwoods. 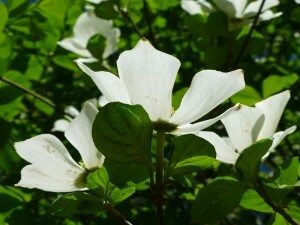 Although they weren’t the explosion of dogwood blooms that last year had, they were very lovely. 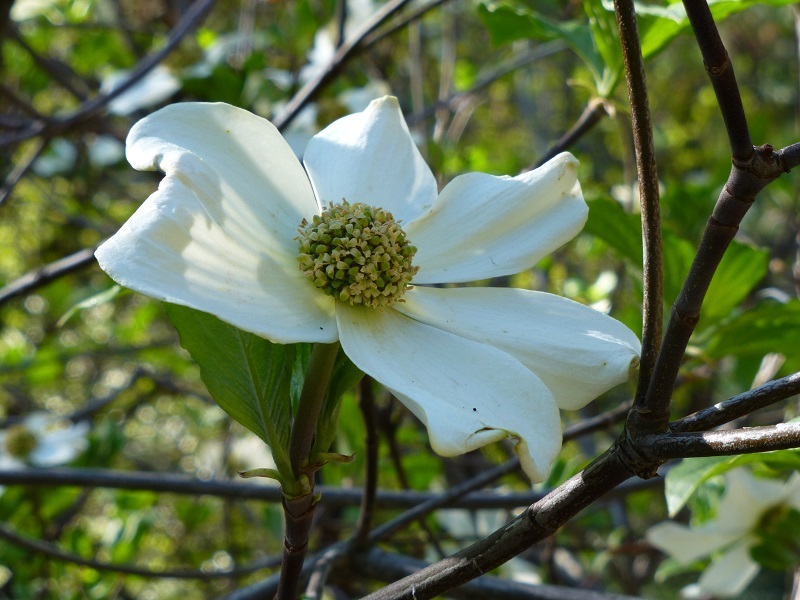 The flower is actually the middle part and bracts are the showy white portion that we sometimes incorrectly call the dogwood flower. 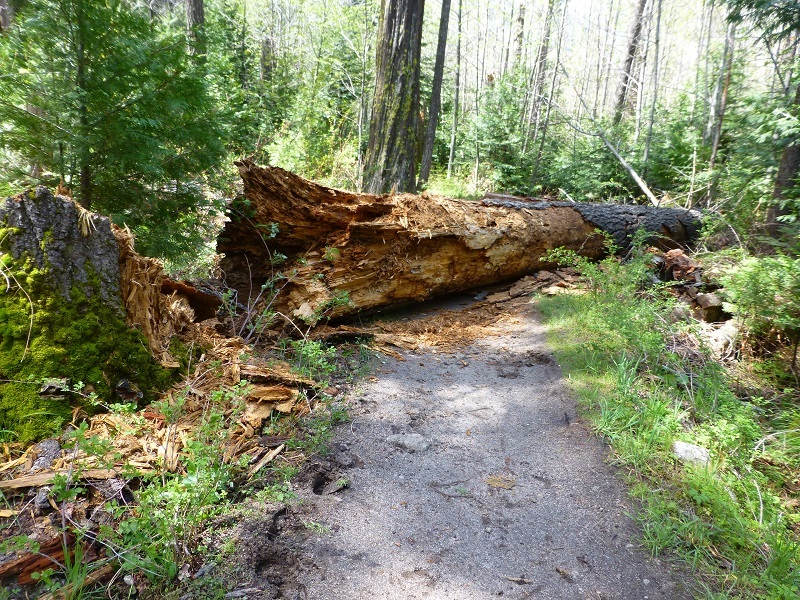 There are many ways that you can get to Mirror Lake but we had ulterior motives in mind for this hike. We took a bit of a longer way up there, but we were also checking out the dogwood blooms. We parked at Curry Village, walking on the path that leads through the Upper Pines Campground. 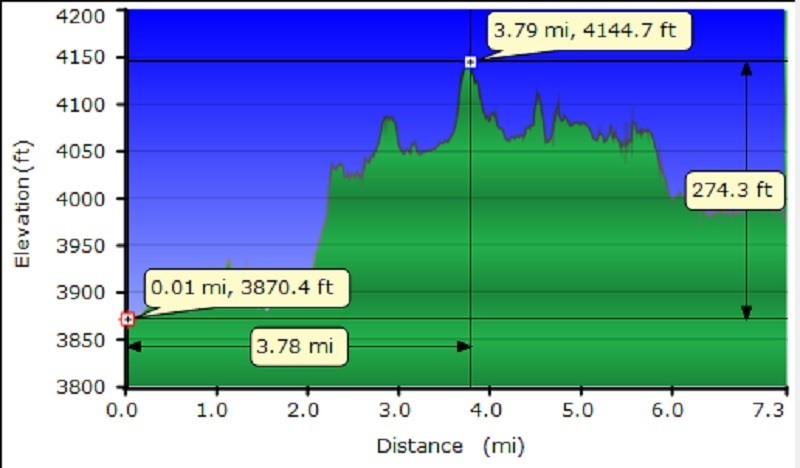 We crossed the bridge on Happy Isles Loop Rd., then started up the trail, following the east side of the Tenaya Creek. 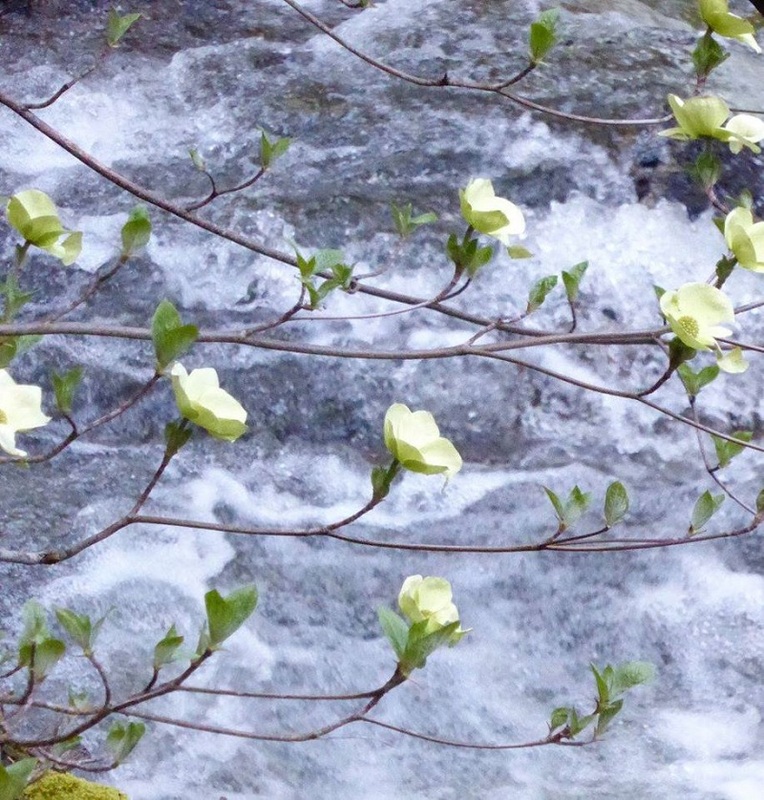 Sometimes we can get some beautiful dogwood blooms hanging over the river. We continued on the trail, following Mirror Lake’s eastern side. As soon as we approached Mirror Lake, the view opened up to reveal to us how it received its current name of Mirror Lake. Native Americans tribes such as the Paiutes lived and traveled though this area long before Yosemite National Park was created and it makes me sad that many of their names for geographical locations related to Yosemite have been lost to time. 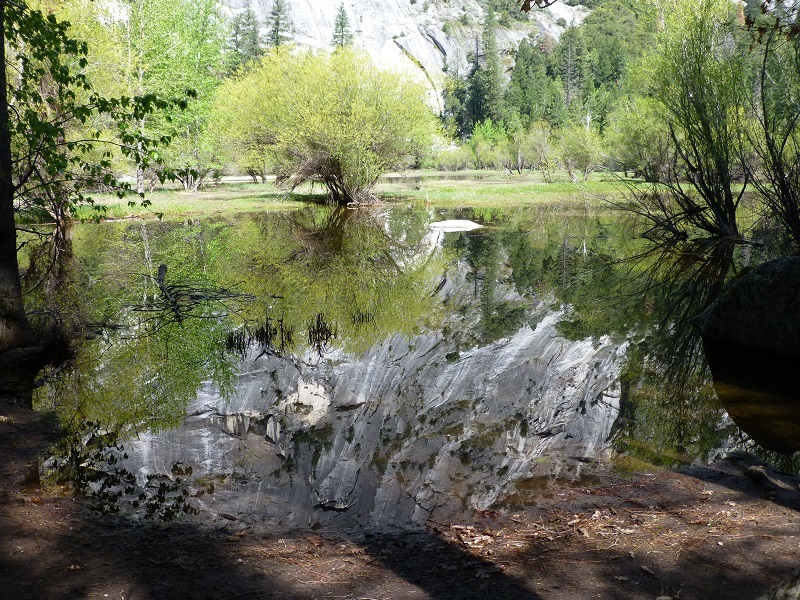 The Miwok Indians were asked what they called Mirror Lake the they said they called it A-wai’-a. Today’s Mirror Lake far different and smaller than it used to be. 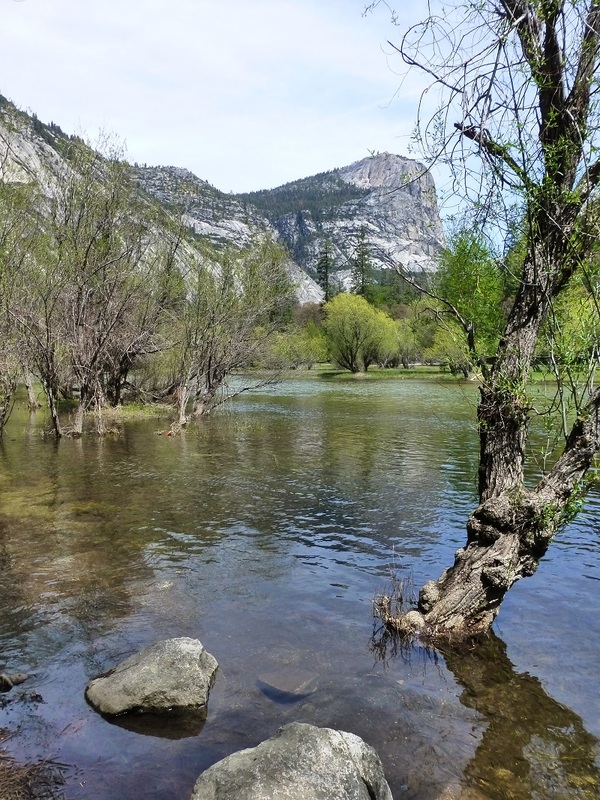 It is all that remains of a large glacial lake that once filled most of Yosemite Valley at the end of the last Ice Age, and is close to disappearing due to the accumulated sediment. Today’s lake can dry up in the summer, leaving no lake at all. How about a little history related to Mirror Lake? 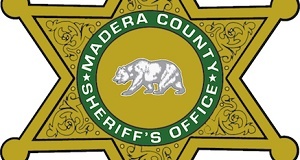 Captain William James Howard was a member of the Mariposa Battalion that some credit with “discovering” Yosemite Valley in 1851. In the 1860s, he built a toll road to Mirror Lake, then a summer house on the lake’s shore. In 1870, construction was completed of the Lake House, a frame building open for public lodging and providing “fine liquors and Havana cigars.” A one-mile toll wagon-road led up to the lake from the Valley. It is said that Leonidas G. Wharton and Peter Gordon were partners in the Lake House in 1870. In 1875, Howard completed construction of his “shake shanty” cabin on the shores of Mirror Lake and at the end of the carriage road. He took over the operations of the Lake House as a saloon and added a dance floor over the lake. This dance floor measured sixty feet by forty feet, extending out over the water. The Mirror Lake House, as it became known, was a favorite night spot. In 1881 Howard’s cabin was demolished by orders of the Yosemite Commissioners as being unsightly. In 1890, the Yosemite Stage and Turnpike Company built a frame icehouse at the lake. I got to wondering where life took these people and what happened to them. 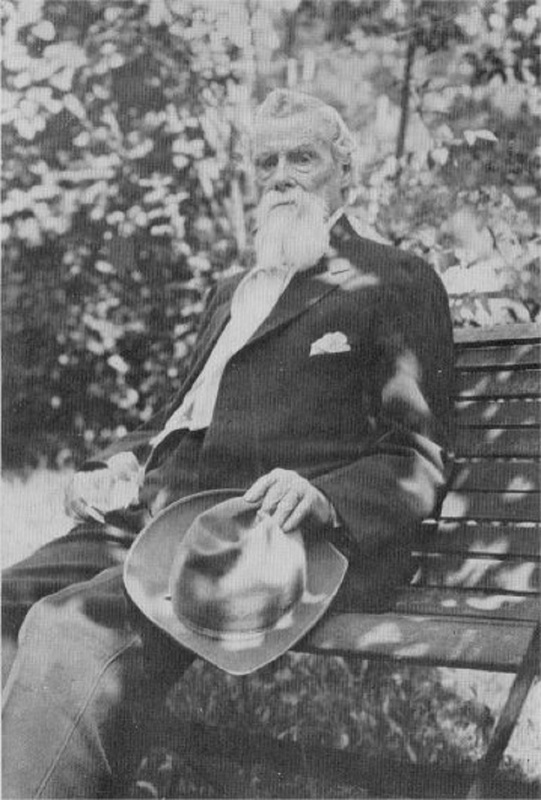 Captain William James Howard died in 1924 at the ripe old age of 97. 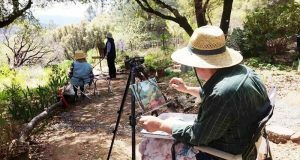 At the age of 93, his story was captured in his book The Last of the California Pioneers. His biased accounting of history is an interesting read if you haven’t seen it (link at the bottom of the blog). 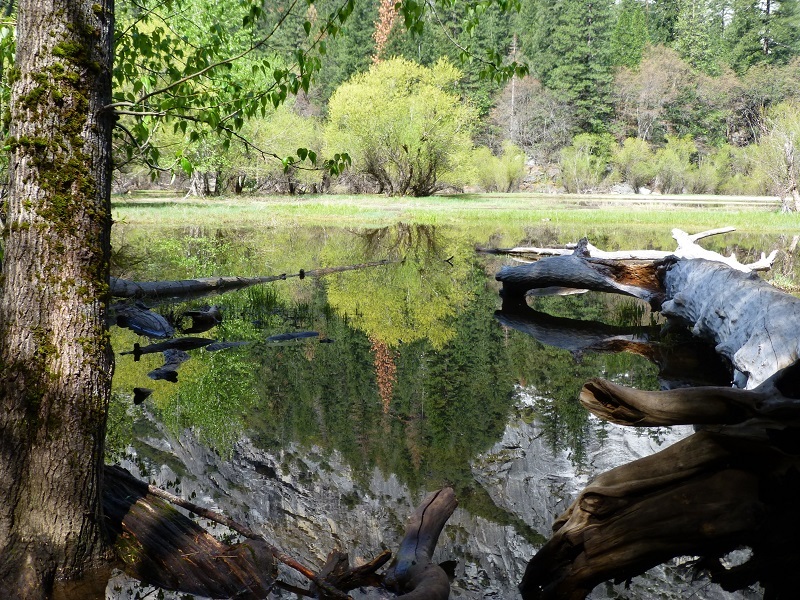 In 1879, the commissioners of the state board governing Yosemite Valley and the Mariposa Grove bought the toll road, made it toll-free, and removed Mirror Lake House. From this point, the battle to “save” Mirror Lake began. 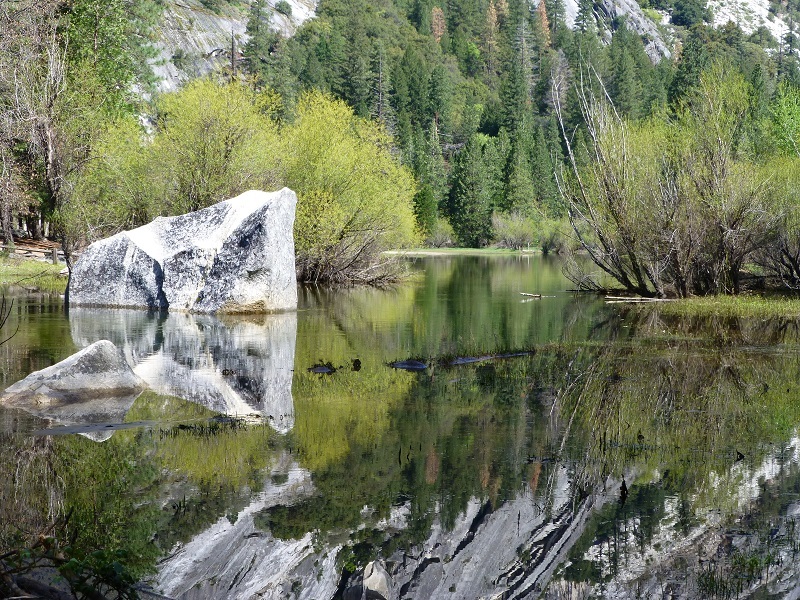 The question of “preserving” Mirror Lake has risen time and again since the early pioneer years. 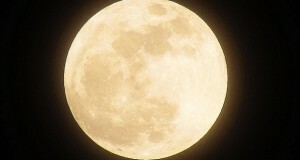 Dredging has taken place repeatedly, the last time in the summer of 1971. 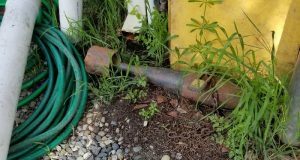 At that time it was done to prolong the life of the lake and to obtain a source of native, granitic sand for sanding winter roads. Now, however, Mirror Lake no longer will be artificially perpetuated. In keeping with the vision for all National Parks, natural processes will be promoted and safeguarded. In the coming years and decades, with each spring torrent, deposition will produce an increasingly shallower and smaller lake, until eventually it will become a meadow. 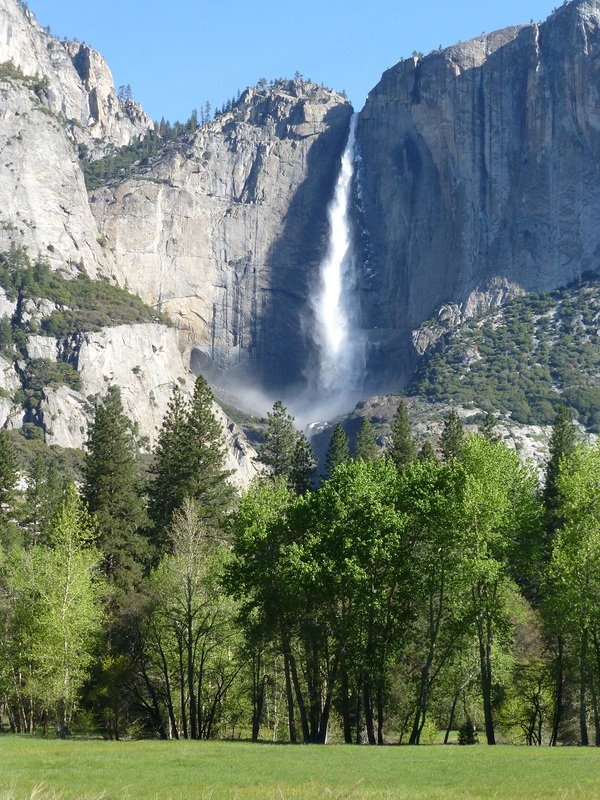 This is identical to the process which has made the floor of Yosemite Valley as beautiful as it is today. 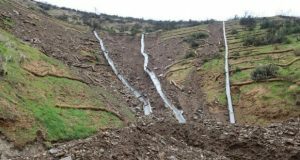 It is believed that preservation of natural features, systems, and landscapes is a dynamic process, achieved by permitting all natural processes to occur undisturbed. Disturbance of natural processes yields unnatural results — thus the decision to allow the destiny of Mirror Lake to be naturally fulfilled. We continued on up the trail, which had large puddles on it, that we easily negotiated. There was one larger tree across trail that we could walk around through the slash but we came across some horseback riders who were having some challenges with one of their horses negotiating one of those water crossings. We continued up the trail, crossing the bridge over Tenaya Creek. 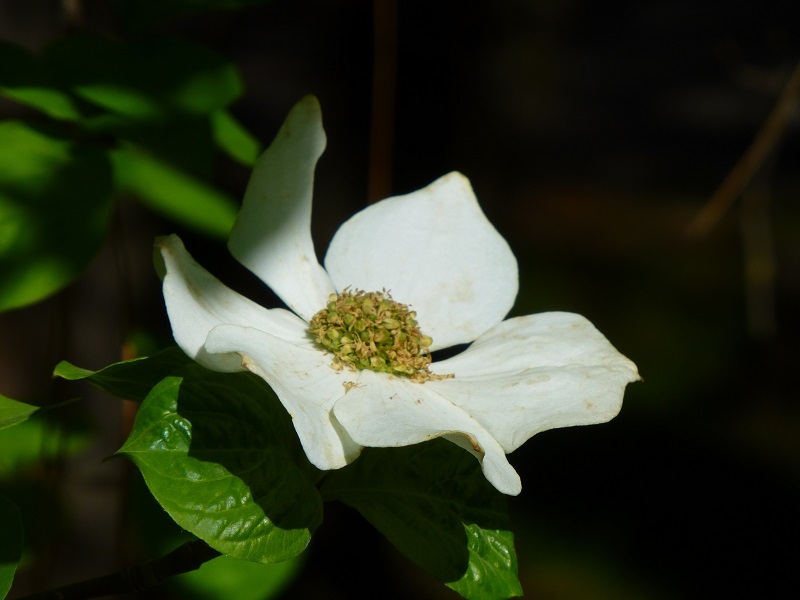 The trail goes through a shady area where there are many dogwoods and we were looking forward to seeing how their blooms were. The smaller trees didn’t have any blooms left but some of the larger trees had blooms higher up. We reached Mirror Lake but the wind had come up and there were no reflections to be had, but we found a dandy spot to have our lunch. 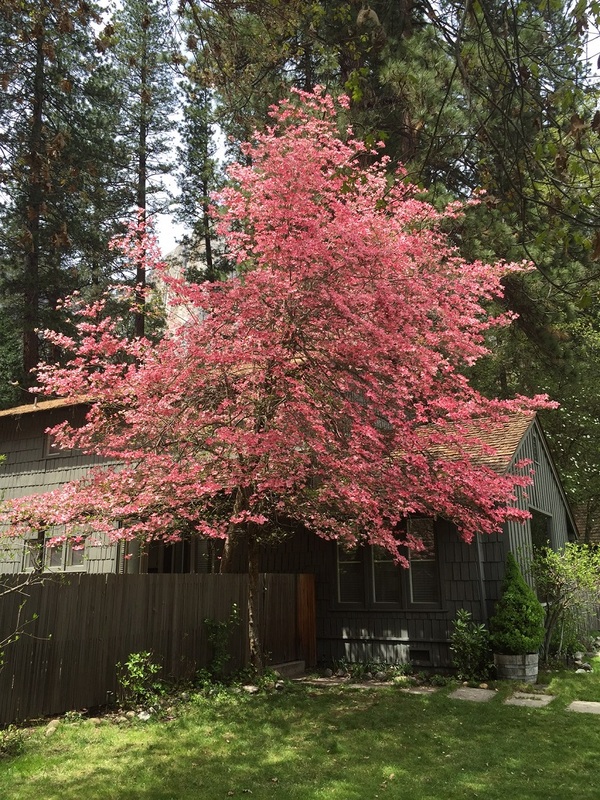 As we were driving back, we could see that the non-native pink dogwoods along side of the Ahwahnee Meadow were in bloom, so we pulled over to get a closer view. 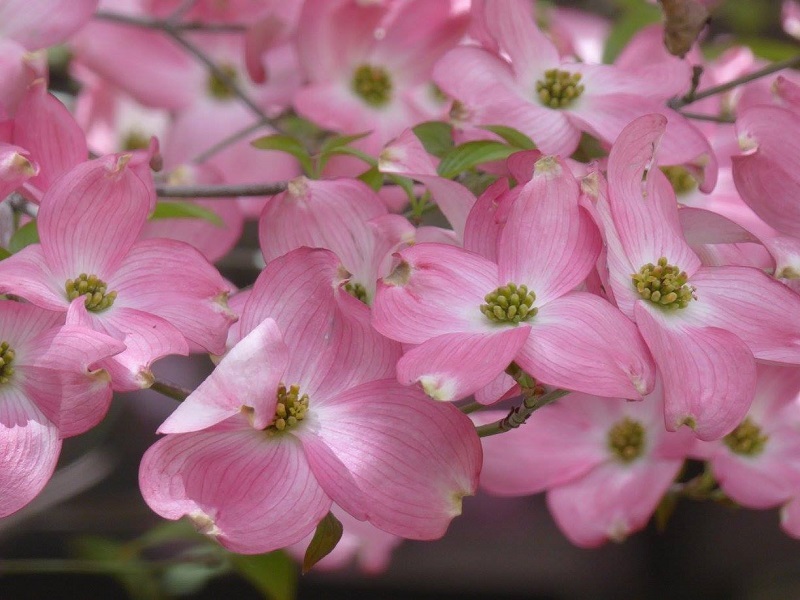 Gail took some closeup pictures of the blooms of this pink dogwood. 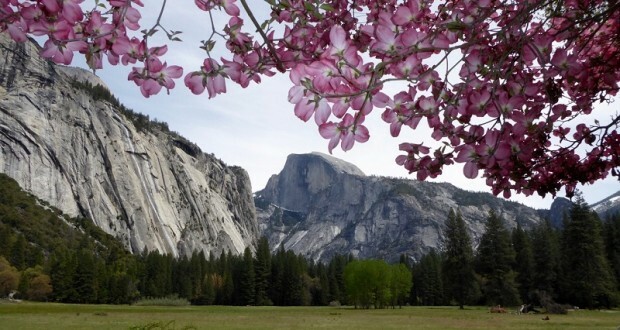 And she took this amazing shot of Half Dome framed by the pink dogwood. 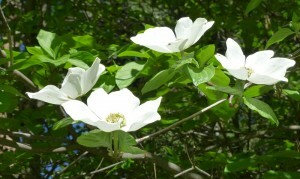 There were also some beautiful white dogwoods in this area. 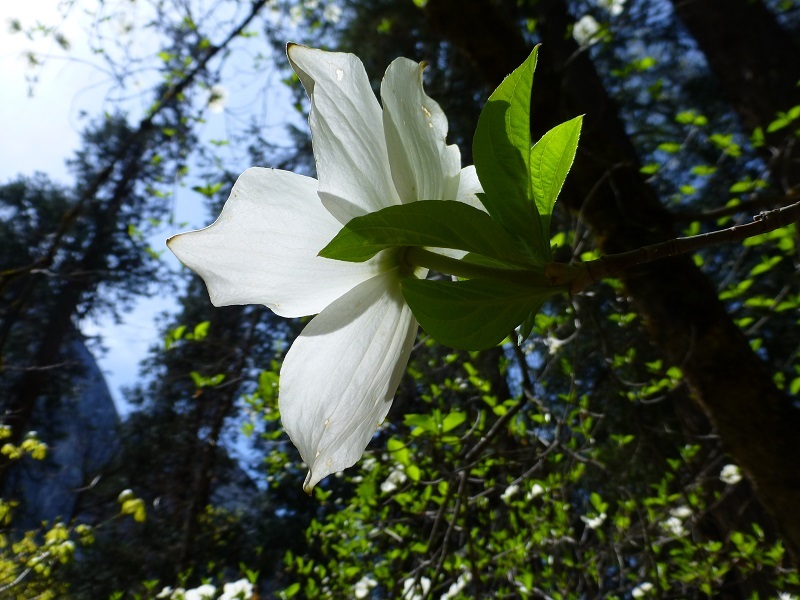 If you are hunting for blooming dogwoods in Yosemite Valley, don’t wait too long as they are nearing the end of their showy blooming period but you may still find individual trees at this elevation with blooms.